A pioneer in interreligious dialogue for the Catholic Church and former Archbishop of Baltimore, Cardinal William Henry Keeler died March 23, 2017 at the age of 86. 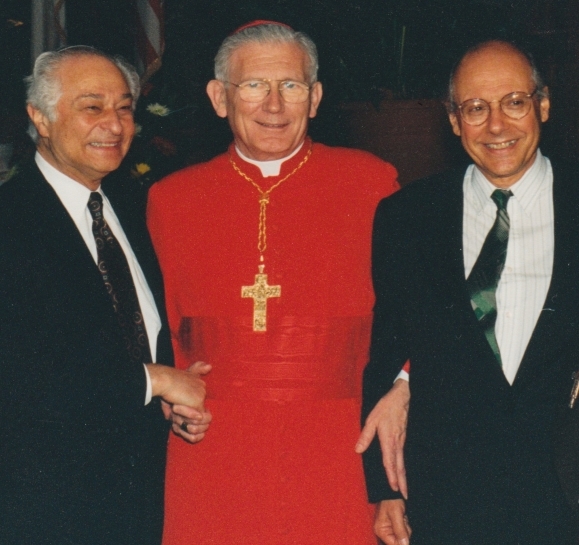 At his elevation to Cardinal in Rome in 1994, Cardinal William Henry Keeler (center) locks arms with Rabbi Jack Bemporad, CIU Director (right) and Joseph Ehrenkranz, co-founder of the Center for Christian-Jewish Understanding at Sacred Heart University in CT (left). Rabbi Bemporad first worked with Bishop Keeler in 1987, when the rabbi became Chairman of the Interreligious Affairs Committee of the Synagogue Council, and Bishop Keeler headed the Conference of Catholic Bishops. “I was extraordinarily fortunate to work with him then, because Cardinal Keeler made sure that the Jewish Community had input in all of the major issues confronting the Bishops’ Conference,” Rabbi Bemporad remembered. In many ways, Rabbi Bemporad owes his 17-years of teaching at the Vatican’s St. Thomas Aquinas University (The Angelicum) to Cardinal Keeler. When Cardinal Keeler was head of the North American College, he asked Monsignor Timothy Dolan Dolan – now New York’s Cardinal Dolan- who was Rector, to allow him to teach Bible there. “It was this experience many years ago that led to my now teaching at the Angelicum and heading the John Paul II Center for Interreligious Dialogue there,” Rabbi Bemporad recalled. “Cardinal Keeler combined a profound sense of compassion and caring and love for everyone he met, with a brilliant capacity to work together to achieve concrete and worthwhile results,” Rabbi Bemporad explained. “I will miss his kindness, great intelligence, experience and wisdom greatly, but most of all, I will miss his friendship,” he added.